We hope everyone had enough time to play around with Oxwall 1.5, since we are ready to give you the next regular update. This release will remedy a few pesky bugs left from 1.5, and will further improve the software performance. Of course, it’s not a proper Oxwall release without a new theme, and this time we are joining the dark (but fun) side, with an all-original Darklets social networking template. Expect more quality themes in the future. Enjoy! This entry was posted in News, Release and tagged 1.5, 1.5.1, bugfix, news by Zima. Bookmark the permalink. will be available in admin panel ? i dnt no whs wrong with my oxwall, when u upload a picture it doesnt appear y? The recent releases, 1.5 and this one, have really wowed me and my users. The new release does not allow comments in the newsfeed. The new release did not feature changes for the Newsfeed comments. Please check your Role Permission settings in the Admin Area. Site activity notifications are now sent to users who haven’t logged in for more than two days ==> Can this be overridden? Whats the actual purpose of this to have in a social network? Strange. The system will be improved in future updates. For the moment its main purpose is to keep the user in the loop of what’s going on with the site, and increase the return rate through email activity notifications for his profile, if he visits the site irregularly, for instance once in few days. I totally agree Zima, but my site doesn’t send this mail to users who haven’t logged in for more than two days. The others email (ex. comment on post…registration…mass mailing etc…) work fine. Good to know thank you, the profile questions bug got me! Try downloading the update pack again and go with the manual update this time. More themes, more themes, more free themes and you push out of the store those who charge money for themes. I hate them!!! Oxwall Store is a free market, so we can’t force developers distributing their items for free. Still, we are constantly working on improving the quality of everything on display there. I like the idea of the paid folks being there. It adds to the options, if the free ones aren’t enough. there are features I am willing to pay a few bucks for. Not sure why, the site was working after the update but I can only assume that is is related to the update today…. It looks like PHP extension MBString is disabled on the hosting. Contact your provider and ask to fix it. Web Host fixed it, they claimed nothing was wrong, but I know they did a server reset, I think the MB_Encoding service failed to restart…. I cannot see auto update. Please can you help to locate this? The auto-update should be there already. If it’s not, report it on the forum. I have not seen any update in admin..When this would be visible??? good job guys! I notice from the screenshot there are some features that are not available in real life installation of 1.5.1. such as sign in with twitter and google. Am i missing something? Twitter and Google Sign-ins are available as separate plugins in the Store. But the plugins will not display icons next to the sign in button on the notification bar area. You need to update your live site to the new version, using either manual or auto update. Lovely update, I love the theme – great update! – I’m not liking that plugins & themes are going up in price, I understand $5, but $20 is a bit much for a plugin or theme (not that its up to you). Thank you for such a great and excellent work! Do you all get well! Tooltips do not work. Rather they work but no inscriptions. At first I thought that the background color is the same color line, it turned out that is not so. How to fix? You can find more info on the matter at the forum. It seems I have been invaded by someone who wants to cause me problems. It will not allow potential new family members to join. Looks like you have ‘invite only’ registration enabled on your site. Go to Admin Panel => Global Privacy and set ‘Anyone’ for ‘Who can join’ option. I have a problem I cannot click “Customize this Page” on the main page of my site but I can click it on other pages like dashboard , .my profiles, forums, etc. how can i so;ve this problem? Please report this on the forum. this version of plugin “Instant Chat” is comet ? At the moment we have no plans for Comet Chat releases. this is a really great software. simple to build up a community for free. how can i build some themes for this great script? In the next update can you make it so I can use recaptcha for the security code instead of your current one. This would make a good difference towards these spam accounts being created. Captcha is no longer considered an effective anti-spam tool, and is generally disliked by regular users. That is why we are planning to implement a new smart join form for the next release, which will generate fake profile questions to prevent spam user registration. The method is believed to be a more effective solution at the moment and doesn’t bother regular users as much as captcha. Captcha should be working fine. If you do have a problem, report it on the forum with further details. Oh please release that soon! I really need it for my site, I have to remove several spam accounts 100’s every week that the anti-spam doesn’t remove. I have the same problem, daily 3-10 spam accounts registering for my site. 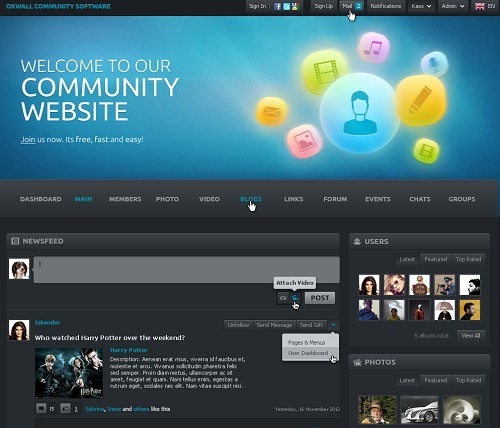 You should contact the theme creator or vendor. You can reassign widgets location on My Dashboard for all users by going to Admin Panel – Pages & Menus – User Dashboard. Please can you add report buttons to the profiles and to the posts on the site. As its hard to monitor the status updates and comments. We won’t be able to do it in the nearest updates, but will consider it for the future. I am currently using version 1.4.0 in JustHost. However, I do not know how to update to the 1.5.1 version. Please assist. Thanks! You need to auto-update through the Admin Panel by clicking on Platform Update (recommended), or implement a manual update of the platform and all installed plugins. Instructions. I’ve just installed the newest version, but in admin mode the layout keeps going wrong. it is ok in the beginning,but after the use of a submenu the main menu becomes verticale,the submenu;s aren’t clickable anymore ,and the rest of the information comes far under in the page after scrolling. Adding a image ,although it places the picture,gives a fault 500 or something like that. and more of these things. Oxwall doesn’t have a native option to add submenues. If you are using a third-party plugin, please contact its developer. The auto update still isn’t available yet….. I am using the minimalistic theme for my site. However, the blog, photos and groups have errors. Can someone please help? The link in the icon is not working. Bring the issue up at the forum. The 1.5.1 update seems to be nice except the admin buttons do not work. The circular ones (Dashboard, Users, Settings, Etc.) I click them and nothing happens. Is your AjaxIM working fine? would a mobile site not be your no. 1 priority right now? What’s a social site if it is not mobile friendly?? Yes, Oxwall mobile version design is about to start. But but my site doesn’t send mail to users who haven’t logged in for more than two days…. The others mail (…registration…mass mailing etc…) work fine. Great work on 1.5.1 !! I too , am noticing that after 1.5.1 , comments in newsfeed does not work. in lower left corner of monitor when I click comment. Can I test your 1.5.1 site? I’ve noticed on the image of the new theme there’re some shotcuts on news feed (Unfollow, Send Message, Send Gift) but when I updated the engine to 1.5.1 and actived the new theme nothing appered. How can I get them? And there’s someway to add more, like ‘Poke’, ‘Report’ etc? I’m new to Oxwall, I downloaded the latest version 1.5.1, but my siste seems not to connect to the css of the site, it is all text. It works fine on my local server on my laptop but not on either of my online servers. Try opening Page Source of any page on the site, find URL to any CSS files, copy and open it in your browser. This way you’ll see what’s the actual problem. After that you either have to contact your hosting and report the issue, or post a new topic on our forum with the error attached. I noticed, in the image of the post, it’s suggest there’s some shortcuts in users post in newsfeed. These shortcuts already exists? If it do, how can I use it? Which shortcuts are you referring to? I set up hosting based upon your recommendation with Arvixe and installed your software using their cPanel. I used the basic plugins that came with it and purchased just a couple more and bought the Facebook deluxe theme. Now that I have started things up and have been advertising it I find that it is so sluggish that it is more or less unusable. Needless to say this is very frustrating. You can list all the issue and submit them on the forum, so that developers can respond to you directly. Please create a topic at the community forum and submit the exact error you are getting.